Action star Dolph Lundgren may be known mostly for uttering classic lines like ‘I will break you’ (as Ivan Drago in ‘Rocky IV’) and blowing stuff up in action flicks, but there is more to him than that. Few may know that, in contrast to his macho man image, Lundgren has a Master’s Degree in Chemical Engineering from the Stockholm Royal Institute of Technology in Stockholm. Graduating at the head of his class, he was awarded a Fulbright scholarship to attend MIT, one of the world’s top engineering schools. Plans to move to Boston, however, got derailed when he met a woman by the name of Grace Jones, fell in love and decided to move to New York City with her instead. The rest is, as they say, history. Lundgren and Grace Jones in 1983, photographed by Albert Watson. 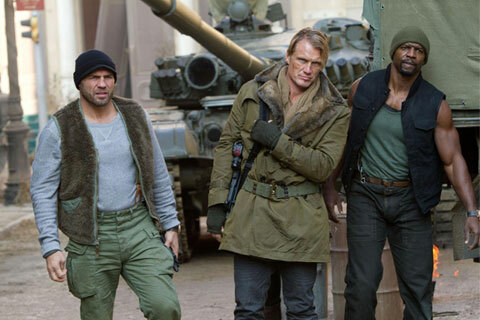 Lundgren, as we are used to seeing him, in Expendables 2, probably getting ready to blow something up. I got a chance to do an impromptu interview with Lundgren at the event (which can be viewed above or here). An accomplished master of martial arts, Lundgren has been captain of the Swedish National Karate Team and an individual champion of the Swedish, European and Australian heavyweight full contact divisions. At 55, he maintains an impressive level of fitness and has a third degree black belt in karate. So what about nutrition? I have to ask, does he drink green juice? “My girlfriend mixes some stuff up, tomato juice, cucumbers or whatever it is, a little bit of that.” Lundgren is currently developing an eponymous line of organic supplements, in collaboration with partners in Sweden. “It will probably be launched next year,” he says. Goodlifer’s Editor-in-Chief, Johanna Björk, with Dolph Lundgren in Los Angeles.